I have another texture for you, and something of a tutorial about how I used it LOL talk about the blind leading the blind. I have got some lovely scrapping time in today. I have been listening to Gabriella Cilmi’s CD that I treated myself to the other day, all that was missing was a nice glass of wine. What a voice this girl has. She is sort of similar in style to Amy Winehouse but without all the drugs and destruction and waste of talent. I had heard her song Sweet About Me on the radio and it took me two weeks to find out the name of the singer. Turns out she is an Australian but moved to UK to record etc. Anyway, on to matters scrapping LOL, this is the linen texture I use. I have had a few emails today asking about this. I simply scanned an old piece of plain linen (I told you I’m not a designer lol). To add a pattern to it, I just use a brush on a separate layer to the linen, either set to darken or lighten, then reduce its opacity until I get the right effect. Something I found out that the very artistic types already know LOL is that you get a better effect if you work with diamonds not squares. I have always tried creating my patterns in a square then it gets tiled and can look boxy. For ornate style designs, you are better working a design or pattern that is a diamond style shape (roughly speaking, not exact), so for a shape that is wider in the middle and narrower on the top and bottom. Now I don’t have a great eye for these things, so I cheated LOL. I have Kim Sheen’s fabby CU Templates from Scrap Orchard, and what I did with the leaf one I shared the other day was to grab one of the layers of her diamond templates, and put that on top of the linen, rotate it or expand if you want. Then worked my design (or position your brush) within the diamonds. When you have it how you want it just delete the diamond shape guide layer. Voila, it looks much better, not so boxy. 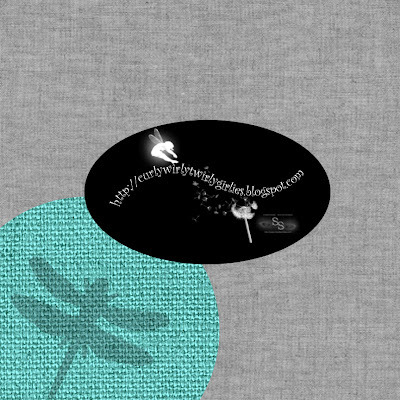 I have included an example of a simple dragonfly on linen, I am short on time so didn’t do anything ornate, and missed every other diamond. I was originally going to put a frog in but it looked wrong and I ran out of patience. But it is enough to give you the idea. It is in a Digitreats Run colour so you can actually use it. By adding different layers of the brush either lightening or darkening you can get quite a fabulous design on your linen. By keeping the layers separate you can make it a multicoloured pattern too on the linen. I hope that actually makes sense – I am not very good at describing things, I can’t explain anything without a whiteboard LOL. Anyway grab the linen texture here and have a play, would love to see what people come up with. this is fantastic! it all makes perfect sense. i'm going to try to take my computer to the store where it was purchased tomorrow and see if they can help me with the error messages. i really want to have a play with these overlays. and now you've given me a good idea of how to start. thanks! Thank you! http://www.cufreebiesonly.blogspot.com/ sent me!